The redevelopment of the YMCA on Foster is being designed by Leeb Architects. We’re back after taking a summer vacation. This roundup covers development news from the last two weeks. The Oregonian reported that millions in infrastructure costs sank the Zidell Yards development in South Waterfront. With the main post office in the Pearl now closed, BikePortland reported that the risk to cyclists from right-hook collisions has dropped. The site is set to redeveloped as part of the Broadway Corridor Plan. The Oregonian took a first look at the newly completed Canopy by Hilton hotel in Pearl District. Demolition has begun on the former Lotus Cardroom and Cafe, according to the Oregonian. The building is being torn down to make way for the 20-story 3rd and Salmon hotel tower. The NW Examiner looked into what might happen with ESCO site on NW Vaughn. City Observatory praised the Portland City Council for reversing its early denial of the Fremont Place Apartments, but noted that the City Council did not approve a zone change for a site at 126 NE Alberta St that would have allowed the construction of 50 below-market, affordable apartments adjacent to the Alberta Abbey. 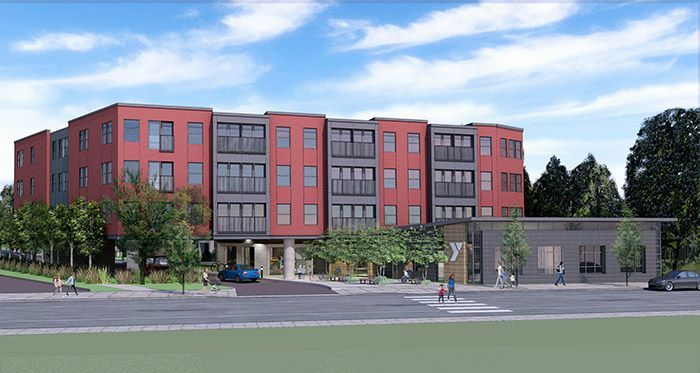 The Daily Journal of Commerce reported on the redevelopment of the YMCA at 6036 SE Foster Rd, which will combine a full-service daycare facility with 48 new apartments*. Portland Architecture wrote about Heartline, the Pearl district development that presents an alternative to the podium typology. The latest potential buyer for Centennial Mills has plans for plans for condos, a park and affordable housing, according to the Portland Tribune. A proposed development at 1727 NW Hoyt St, designed by Carleton Hart Architecture for Northwest Housing Alternatives, would include 149 units of affordable housing. The Oregonian reported that the management group behind the Portland Diamond Project, which hopes to bring Major League Baseball to the city, have put in offers for two sites: the Portland Public Schools Blanchard Education Service Center near the Rose Quarter and the Esco Industrial site in Northwest Portland. The paper also reported that the group has spent $30,000 lobbying city hall to date. The Willamette Week reported that the offer to PPS would include giving the school district the former Banfield Pet Hospital Headquarters on 82nd Avenue. History Treasured & Sometimes Endangered wrote about how the threat of a large apartment building at 1727 NW Hoyt St has led one neighbor to dig deep into history. Portland for Everyone wrote about how an upzone at 126 NE Alberta St would turn a parking lot into 50 below-market-rate homes. An op-ed in the Oregonian described the proposal as the “21st-century version of red-lining“. The Daily Journal of Commerce reported on plans for to build the Oregon Harbor of Hope homeless shelter at the Broadway Bridge. The proposal is latest in a number of plans for the site*, which have included One Waterfront Place and the Broadway Bridge-Naito Parkway Apartments. In an article about the project the Portland Tribune revealed that plans for a shelter in an existing building at 320 NW Hoyt St have now been abandoned due to the high costs of converting the building to a new use. OPB reported on Portland Community Reinvestment Initiative Inc’s plans to plans to bring African-American families back to North Portland. The Portland Business Journal published a visual tour of CENTRL Office’s latest space in the 12th & Morrison office building. The Daily Journal of Commerce published construction photos of the Redfox Commons. The project involves the conversion of the Old Freeman Factory in Northwest Portland into creative office space. The Daily Journal of Commerce wrote about Hacker, the architecture firm taking “wood to the next level“*. Next year firm will move into a new office framed with cross-laminated timber that they designed at 525 SE MLK. A sponsored post at the Oregonian covered the TwentyTwenty Condominiums, currently under construction at 1177 NE 21st Ave. The building is one of only two large condominium developments currently under construction in Portland. The Oregonian reported that Prosper Portland chose Denver based Continuum as the master developer for the Broadway Corridor. The project will include the redevelop of the main post office site in the Pearl. Prosper Portland is in negotiations to sell the Centennial Mills site to Texas based developer Lynd Corporate, reports the Oregonian. KOIN reported on a zoning proposal that would enable a developer to build affordable housing on the parking lot at 126 NE Alberta St, which has neighbors concerned. After three decades at the city and nine years leading the Bureau of Planning and Sustainability, Susan Anderson will be stepping down from her role at the City of Portland, reports the Willamette Week. Columbia Sportswear CEO Tim Boyle plans to contribute $1.5 million to help build the Oregon Harbor of Hope at a site at the Broadway Bridge, reports the Oregonian. The Willamette Week wrote about five key facts about the press conference that brings developer Homer Williams to closer to building a homeless shelter. The Daily Journal of Commerce published photos of the finished PSU Viking Pavilion.